In the late 1990's, the significance of computer literacy became more recognized on a global basis. Many countries began to make a more active effort to promote computer education. Under such circumstances, the needs for us to fly to train local teachers declined. We also lost the major funding (please see the Malawi project below) that has supported many of our IDCE programs. We have tried to raise funding in different ways, but have not been as successful as we hope. Despite those circumstances, we have been able to offer the following programs in computer donation and/or IT education, to the below 8 countries. (Please scroll down or click below). We hope to continue our efforts so that we can make further contributions. In the summmer, 1994, successful story of IDCD/Zimbabwe was mentioned at the Southern African Science and Technology Community (SASTeC:consisting of 12 countries at that time). Hearing about it from a friend, Malawi UNESCO requested us to bring IDCE to Malawi. Like we have done previsouly, we prepared the donation of 200 computers and arranged to apply for the same grant, which had supported our IDCE projects in Thailand, Ghana, Poland, Kenya, Zimbabwe and Peru. 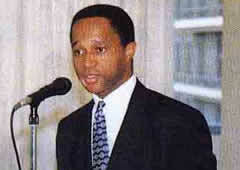 However, the director of the grant organization, who saw each of our project independently (i.e. IDCE/Peru as a Peru project, IDCE/Kenya as a Kenya project, ...) and who always supported IDCE, had just been sent to another department, and a new director was appointed. Unfortunately, she saw our project as [one] project by IDCE and told us that they could no longer support us because they could not just continue supporting one organization. As a result, we lost the key funding. This was a great loss as IDCE almost totally depended on this particular grant. We tried to raise funding in many different ways, but none was successful. It could have also been due to the sudden depression of the Japanese economy, but it was quite frustrating to see our IDCE slowing down. As a result, we had to put IDCE/Malawi on hold. 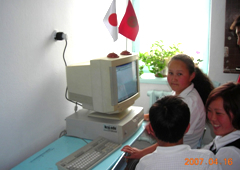 In Nov. 1998, as a collaboration with Doshisha International High School, we were able to ship the donation of 222 computers, including Windows-type desktops and portable notebook computers. In December, 2007, we met His Excellency Mr. Roosevelt Laston Gondwe, the Ambassador, and discussed our next collaboration. Since June, 1996, we have concluded a series of Cooperation Agreements with donation of computers, between KCG and Tianjin Foreign Studies University, Xi’an Foreign Language University, and Capital Normal University. There was a strong demand from the Japanese language students to learn computer technology. 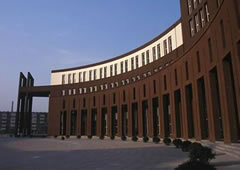 The donated computers placed at Tianjin Foreign Studies University were used for their students to learn both computer technology and the Japanese language. Tianjin University of Science & Technology established a KCG course that follows KCG curriculum; it has been sending students to KCG since 1998. In exchange, KCG also sends instructors there for an intensive course twice a year every year since then. On March 25, 1996, with the reference by JICA, the director of the Southeast Asian Ministers of Education Organization, Regional Centre for Vocational and Technical Education and Training (SEAMEO VOCTECH) visited KCG, Japan. That was the beginning. On December 12, 1996, we concluded a cooperation agreement between IDCE and SEAMEO VOCTECH (South East Asian Ministers of Education Organization, Regional Center for Vocational and Technical Education). SEAMEO VOCTECH is an international organization which the Ministry of Education of nine South East Asia countries established in 1965 for the purpose of educating people in the sciences and humanities. The Japanese government has been supporting this organization for purchasing equipment and for providing training programs. In March, 1997, we sent three instructors to conduct a seminar on network technology to SEAMEO VOCTECH. In October, 1997, we also invited SEAMEO VOCTECH members for a computer training course at KCG. March IDCE sends 3 KCG instructors to SEAMEO VOCTECH（東南for a lecture and a seminar on internet. October IDCE invites members of SEAMEO VOCTECH to KCG for a more advanced seminar. 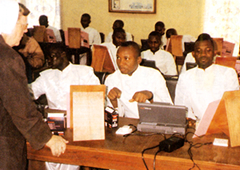 In 1998, Sister Gean, then at Sister of Notre Dame in Kyoto, who was a friend of KCG's trustee, made a request to donate computers to Nigeria. In August, 1999, we donated 40 notebook computers to the country. They were later placed at St. Augustine School, located in Plateau. 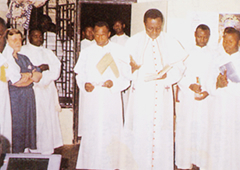 In July, 2000, late Sister Sharon, then at Sister of Notre Dame in Nigeria, visited KCG. At the inauguration of the Kyoto College of Graduate Studies for Informatics, we had an honor of the presence of His Excellency Mr. Grant Ehiobuche. 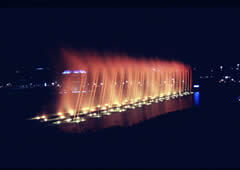 At that time, we discussed our next project but we were not able to get enough funding to go further. We hope to collaborate in the near future. 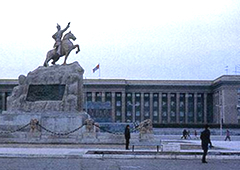 In the summer 2002, International Relations Office of Kyoto City made a request to us to bring IDCE to Mongolia. In December 2002, we made a donation of 40 computers along with 5 printers, and a computer center called, "Open Japan Center" was established based on our donation. The opening ceremony took place on 26 Feb 2003, and we visited the center with our instructors. 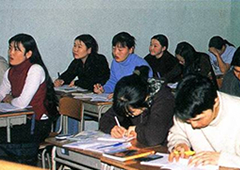 In the spring 2003, we invited two teachers from the Open Japan Center to KCG, Japan, for a seminar. 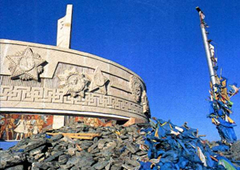 "Our govenment officials are glad to know that you are going to assist us to establish [Open Japan Center] which will make a great contribution toward promoting Japanese culture and develop computer education in Mongolia," Dr. Enkhchimeg, the Ministry of Education, Culture and Science, wrote, "Use of thte Center is basically free of charge for orphans and open to the general public, especially the students of high schools, colleges, and other specialized schools." Donated 40 computers to the Ministry of Education. In response to a request from the Ministry of Health in Tanzania, IDCE was initiated in 2004 with the help of IPIL-IPIL NO KAI, a non-governmental organization. 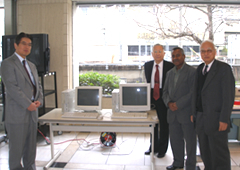 In October, 2004, we donated 30 desktop computers to the Ministry through the Embassy of the United Republic of Tanzania in Japan. These computers were installed in two Primary Health Care Centers under the jurisdiction of the Ministry and have been widely used for training health professionals and social workers on health care information management. 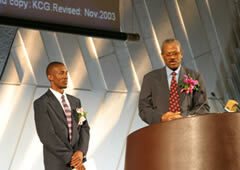 In Nov. 27, 2007, we had an honor of welcoming His Excellency Mr. E.E.E.Mtango, Ambassador, to KCG, Kyoto. We discussed our next collaboration. We are excited by the plan of applying for a grant together in the near future. November of 2008, 50 computers were donated to Muhimbili University (Medical school) in Dar es Salaam. 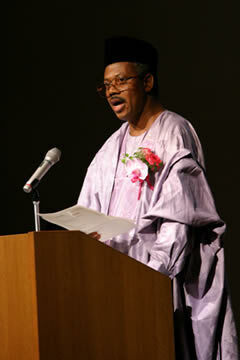 Ambassador of Tanzania Embassy in Japan showed gratitude about donated computers. 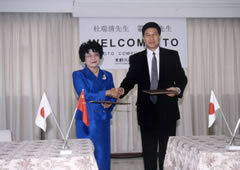 In October 2006 when Yasuko Hasegawa won the International Co-operation Special Award by the ITU Association of Japan (http://www.ituaj.jp/english/index.html), there was an award ceremony. Among the attendee was His Excellency Mr. Askar Asanbekovich Kutanov, the Ambassador of the Kyrgyz Republic in Japan. 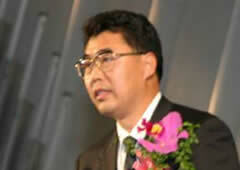 During the reception, he approached Yasuko and asked if the Kyrgyz Republic could also benefit from IDCE. The Embassy later officially made a request and IDCE/Kyrgys was initiated in November 2006 with a donation of 50 desktop computers. They were delivered to the Kyrgyz Ministry of Education, and later were distributed to 12 schools located in regions of country. Сейдикум айыл окмоту, с.Жленичи сш.им. 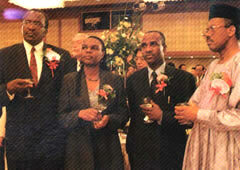 Сыдыкова M.
In October, 2006, the government of the state of Eritrea formally requested us to donate computers through Mr.Yoshikazu Ito, a JICA expert for the Demobilization and Reintegration Program in Eritrea. 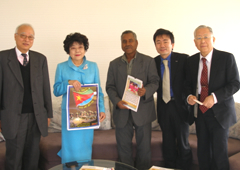 Signing ceremony with Ambassador of Eritrea. 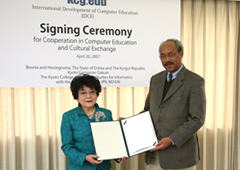 In March, 2007, donation of 30 desktopcomputers was delivered to Ministry of Education represented by the Department of Adult Education and Media. 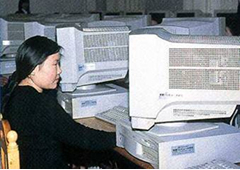 These computers were to be used for the vocational training programs aimed at reintegrating demobilized soldiers. IDCE was initiated with the support of a non-govenmental organization, IPIL-IPIL No Kai, which served as a bridge between IDCE and Ministry of Education in Bosnia and Herzegovina. A donation of 45 desktop computers were delivered to each country through the Embassies of the Bosnia and Herzegovina in Japan in April 2007. These computers were to be used at technical schools in rural area as a part of ICT education. The collaboration is in progress.